Laid down, 8 September 1944, as a Maritime Commission type (VC2-S-AP5) hull, under Maritime Commission contract (MCV hull 571), at Permanente Metals Corp., Richmond CA. Returned to the Maritime Commission, 9 April 1947, for lay up in the National Defense Reserve Fleet, Suisun Bay, Benecia, CA. 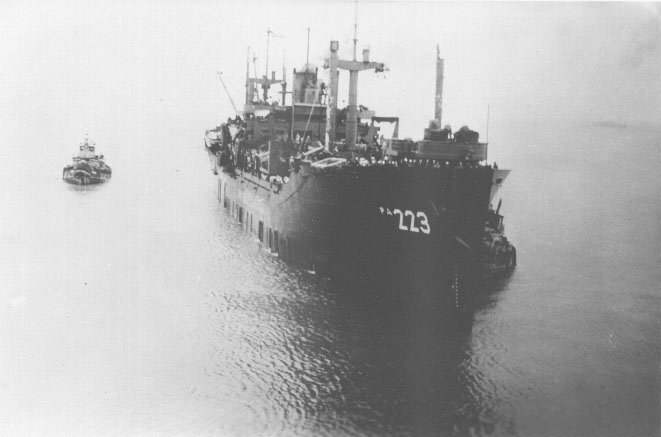 38k USS Pitt (APA-223), returning from the Pacific, preparing to dock at San Francisco, CA., circa early July - late August 1946. David W. Dorsey, Sr.